Do you put graphite on the tread surface of your wheels? Come on, you can admit it. I started rubbing graphite onto the tread surface about eight years ago. It seemed like a good thing to do, and it made the tires look nice and shiny. But honestly, during this time I didn’t know whether it did anything to improve the speed of the car. So I decided to test whether applying graphite to the tread surface has any effect on speed. While doing this, I also tested the benefit of applying graphite to the inside edge of the wheel (the part of the wheel that touches the center guide rail). Extended wheelbase Wedge Body, weighing 5 ounces, with the balance point at one inch in front of the rear axle, and a raised front-left wheel. Pro-Stock Speed Wheels from DerbyWorx – These official BSA wheels are accurately trued, but are not weight reduced. Speed Axles from Maximum Velocity polished with Brasso. A 32 foot anodized aluminum Freedom Track with a Judge Timer. For each run the car was staged in the left lane. Before mounting on the car, the wheels were thoroughly lubricated with Max-V-Lube. 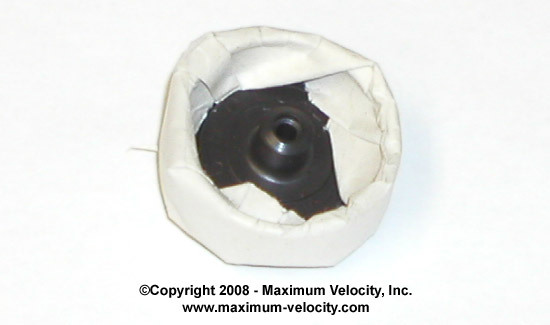 To prevent the graphite from getting onto the tread surface or inside edge, the wheels were wrapped in paper (Figure 1). After lubrication, the paper was removed and the wheels were mounted on the car. The car was then aligned, and given a few break-in runs. The car was run six times, the high and low runs were removed, and the heats were averaged. Graphite was applied to the tread surface of each wheel. This was done without removing the wheels. To prevent graphite from getting on the inside edge of the wheel, a piece of cardboard was pressed against the inside edge of the wheel. Again, six heats were run, the high and low runs were removed, and the heats were averaged. Without removing the wheels, graphite was applied to the inside edge of each wheel. A final set of six heats were run, the high and low runs were removed, and the heats were averaged. The following chart shows the results of the test. As you can see there was a slight improvement in performance when graphite was added to the tread surface, and then again when it was applied to the inner edge. Note that the amount of overall improvement is only four thousandths of a second. However, the heat times were very consistent; the standard deviation (amount of deviation of the heat times from the average) is quite small (ranges from 0.0005 to 0.0017). Thus, the improvement, albeit small, cannot be completely attributed to statistical noise. Although the small improvement could be important in a tight race, lubricating the tread surface and inside edge is an extremely small factor in overall performance. If allowed in your race, I would certainly do it, but you would not suffer a significant performance penalty if you choose to not lubricate the tread. Another factor to consider is that the anodized aluminum track on which the experiment was run is extremely smooth. It is possible that if the experiment was run on a rougher track, there could be a larger performance improvement. However, rougher tracks do not generally provide consistent heat times. So the standard deviation of the heats would likely be much higher, and any improvement could be buried in the statistical noise. My 8-year-old daughter took skiing lessons this year and was wildly enthusiastic about the sport. Her first car design was a natural expression of her new-found passion. She placed second in the siblings race at our Pack. 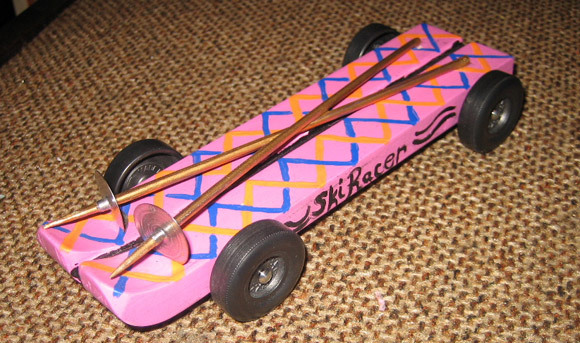 My father and I take pride in creating full-bodied NASCAR style pinewood derby cars. Since the COT (Car of Tomorrow) made its debut last year in the Nextel Cup, we have been trying to create a pinewood derby version. This year we were able to debut our first ever COT at our local SAPCAR pinewood derby racing event. This car is my daughter’s submission from her April 2008 Awana Grand Prix race with Adamsville Baptist Church. The paint is a bright pink with ghost Lemans stripes. The car features an extended wheelbase wedge design, offset front wheels, and raised right front wheel. We used flat black under the nose to ensure instant timing light trigger. All the tungsten weight is located near the rear axle, precisely at 5.0 ounces. The wheels are race-ready, graphite-coated slicks. The axles were smoothed and grooved to reduce friction and utilized Krytox oil rather than graphite lube. The car raced a total of eight class heats. It sped to 1st Place – Top Speed in Class, then Top Speed Overall to beat all competition, including parents. The car also garnered 2nd place in class for design. We’re looking forward to starting our 2009 Awana Grand Prix racer. By the way, Brianna was also the reining 2007 Top Speed Overall. How do Pinecar wheels compare performance wise to the BSA wheels if preparation is the same for each? I have not directly compared them, but from comments of others, BSA wheels tend to be a little faster. The PineCar wheels have most of the weight on the outer circumference, which increases wheel inertia, and slows down the start. My son has a question that I can’t answer with certainty. He said that when you drop two objects with different weights from a same height they will arrive to the ground at exactly the same time, if they have the same wind resistance. 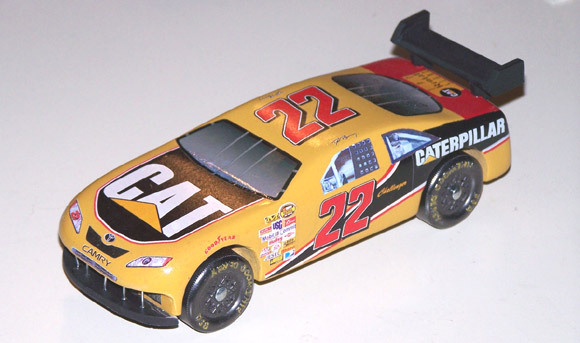 So, why is the heavier pinewood car usually faster than a lighter car, given that the amount of weight is the only difference between the two cars? I think it has something to do with the friction on the wheels and axles, but do you have some scientific explanation for this? 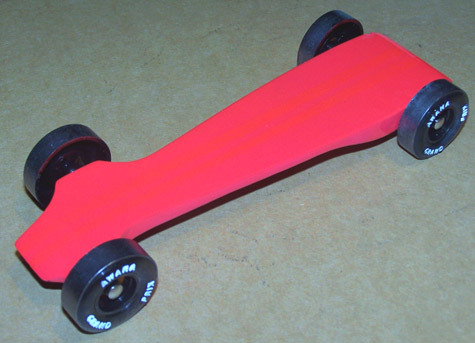 Would all pinewood derby cars have exactly the same speed and arrive at the same time at the finish line if there is absolutely no friction and no wind resistance? You are correct that two objects, regardless of mass, dropped from the same height will hit the ground at the same time if they are in the presence of a vacuum (no air). You are also correct that if there were no friction or wind resistance, then all cars would arrive at the finish line at the same time regardless of the shape or weight (or at least they would be close – wheel alignment would affect the result). But in reality, friction does exist. When the car reaches the flat part of the track, it will have achieved its maximum speed. It will then begin to slow down. The rate at which it slows down is dependent on the amount of friction, and the mass of the object. Momentum (which is mass times velocity) is the force that helps the car overcome friction and keep rolling. So the heavier the car, the greater the momentum, and thus, the better performance. Of course, reducing the amount of friction through wheel/axle preparation and lubrication are vital as well. Some older tracks do not have a flat section – they just have a continuous slope from start to finish. On these tracks, mass is less important than on a standard track, however, it is still needed to overcome all of the frictional forces.